San Luis Obispo, CA, October 18, 2011 - Canidae Racing's top fuel sand drag team led by driver Scott Whipple and master engine tuner Amos Satterlee will be back in action at the Southern California Sand Drag Association "Pumpkins and Paddles" race being held October 21-23 at Soboba Casino in San Jacinto, California. Canidae Racing comes into the weekend holding world records on the sand track for quickest elapsed time (ET) 2.221 seconds and fastest miles per hour at 166.05 mph. The Southern California Sand Drag Association (SCSDA) capped off the Paddles and Pumpkins weekend at the Soboba Casino in San Jacinto, CA with some great on track action. Team CANIDAE & Scott Whipple charged to a stellar 2.38 in the final round to defeat Jeff Janoe in the Top Fuel final round. It was a familiar story in Top Alcohol as Gary Mink used consistently stellar ET’s to advance past first time finalist Billy Morris in the final round. Top Eliminator saw Paul Taylor in the Outta Control Dragster take his first win of the season. Don Diffenbaugh scored a popular first Fast Fours class win with his Poison Ivy dragster, defeating Aaron Mamer in the final round. Pro Mod Unlimited was another class dominated by Geoff Gill & Larry Minor Motorsports taking their second class win on the weekend. There was some great bracket class action as well on Sunday. Mark Ratliff was the day’s big winner sweeping the Motorcycle Pro 1 & 2 classes. Other big winners include Keith Ahart (Pro 1), Christopher Wells (Pro 2), Charlie Johnson (Pro 3), and Ryan Rodriguez (Junior Dragster). Note: ALL Run Sheets are NOW online (10-25-11). Dome Valley Raceway in Wellton, AZ played host to the Second Annual October Showdown on the weekend of October 1. Despite warm temperatures a great turnout of west coast racers battled it out for their class trophy. Let’s take a look at the highlights. 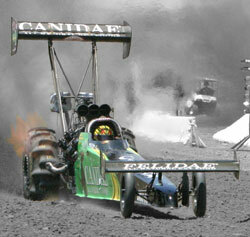 Three stout entries were on hand at Dome Valley Raceway to compete for the Top Fuel title in this event. Qualifying saw Jeff Janoe lead the pack with a sizzling 2.373/155MPH blast on Friday night. Dennis Rieck ran a great 2.454/126MPH in Q1 with the Small Block-powered Fueler that would leave him in the second starting spot. Rieck would be on a better run in Q2 with a 1.004 60’ before breaking a crankshaft resulting in major engine damage. The Hammer Down team would have their work cut out for them, but would make the first round call for eliminations. Butch & Terri Blair’s Fugowie struggled a bit in qualifying with a 2.78 best, but they would pick up the pace as we headed into eliminations. 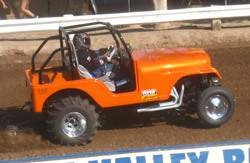 The Southern California Sand Drag Association (SCSDA) is preparing to hold their second event of 2011 on October 21-23, the Pumpkins & Paddles race, at the Soboba Casino in San Jacinto, CA. NSDN will be on-site with race coverage from this event. The SCSDA has also released their 2012 race schedule of events at the Soboba Casino venue; March 30-April 1; May 18-20; Sept 28-30; Nov 2-4. Read on to view full event info & flyer for the upcoming Pumpkins & Paddles race. Atoka Motorsports Park in Atoka, OK held their Annual Fall Fest event over the weekend of October 7-8. There was two big days of racing action with Friday night featuring Pro 1 Cars & Quads action after Test and Tune was complete while Saturday saw all classes in action. A couple of TE cars were testing in anticipation of the November Top Eliminator Shootout. Mike Smith ran Low ET of the day with his Turbo 4-cylinder Dragster running a 3.18 while Marc Luce was also making some test passes in his screw-blown BBC powered Dragster. Read on for full results from this event.